In recent years, the awareness of connected devices, smart home and Internet of Things (IoT) has rapidly increased. It is estimated that global deployment of connected devices will reach nearly 26 billion by 2020, forecasted by Gartner Research. Followed by this trend, smart building or smart home solutions are increasingly popular as consumers are desire for convenience and expect for more effective and efficient ways to enable an increase in comfort, energy management and enhanced home security. IoT market seems to be in a period of huge growth, and three are increasing number of companies plan to implement IoT-related business for higher potential value. However, IoT Security is also a huge effort for small manufacturers producing most of the IoT devices and is often neglected, and it is found that only 48% of the companies put effort in their devices in development phase. Also, due to tight development schedule and insufficient knowledge, the majority of IoT solution providers ignore the importance of IoT security. Moreover, there are many risks on IoT devices including a large number of data transmission and not requiring complex password. Furthermore, IoT devices are resource-constrained in terms of power/performance/functionality, thus it is impossible for network administrators to know what’s going on with all devices. 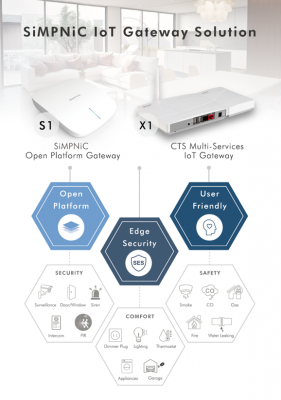 Therefore, SiMPNiC, a professional IoT integrated solution provider, aims to solve these IoT security problems which may result in potential damages to users, and offer the best solution of IoT security Mechanism, Edge Security, to ensure users utmost peace of mind.